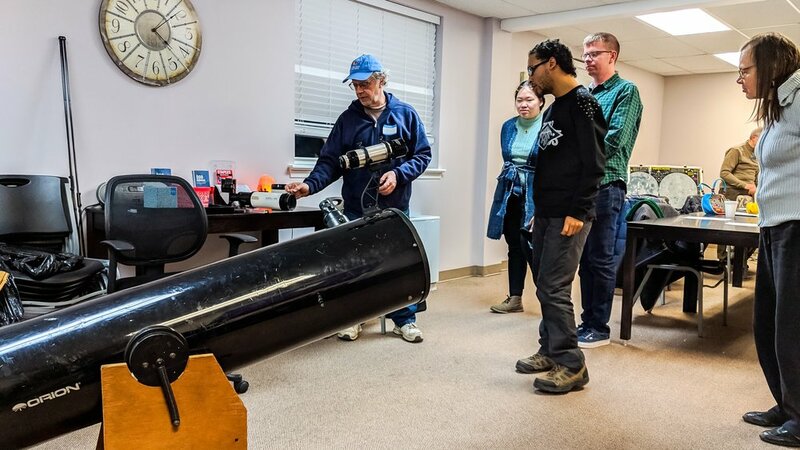 On the evening of March 13th, Amateur Astronomers, Inc. came to ACI to do a wonderful interactive presentation on the night sky! The participants listened to presenter, Mike Gironda, talk about not only how to find things in the night sky, but expanding on last year’s event by teaching information about aspects within constellations and fun facts about our galaxy. The second presenter, Jim Nordhauser, brought equipment for participants to learn about and interact with. He had different types of telescopes and binoculars as well as a huge telescope that he built himself. Before and after going outside to look at the night sky, participants enjoyed cups of hot cocoa. Thank you to Mike, Jim, and Mary of Amateur Astronomers, Inc. who made the night entertaining and informative! Posted on March 19, 2019 by Brian Mazzarella and filed under Social Rec.